War Thunder has just taken delivery of a huge shipment of new tanks and anti-aircraft guns and jet planes and maps and modes. Dozens and dozens of the things. More than I can possibly list here. It’s a staggering number, frankly. I’m reeling. Stunned. I’m having to re-evaluate everything I think I know about War Thunder, because War Thunder 1.43 has flipped Gaijin’s free-to-play warfighter MMO on its helmet. Where do we start? Well how about here: you can turn off weapons and race planes through canyons. Fantastic. Here’s a video detailing some of the changes in War Thunder 1.43, which goes live today, narrated by a man who carefully enunciates words as if each syllable is holding his family hostage. 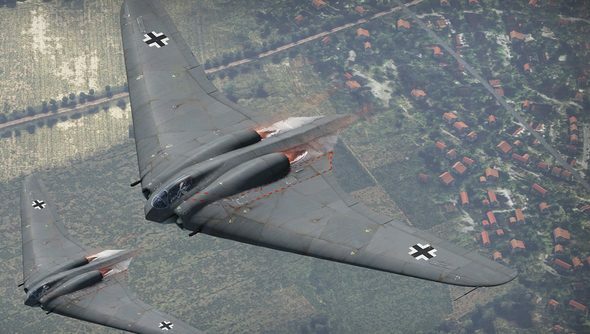 A more comprehensive list of changes can be found over on the War Thunder website, with my personal highlights being the Luftwaffe’s iconic experimental single-wing jet fighter, as well as the Sniper Elite style x-ray vision mode as shells pierce tank armour and explode inside cockpits. It genuinely is a monumental overhaul for the WW2 tank ‘n’ plane fighter, adding heaps of new content, four new maps, as well as lavishing much of the existing stuff with all new sounds and visuals. There’s also that race mode, which takes place around a tropical island map in which weapons were never invented and World War II pilots co-exist in harmony. Beautiful. A delicious serving of warporn for an eager fanbase with a bottomless appetite for tanks.